At Rienco Consulting, our hydrologists are experts in the area of surface water hydraulics, flood mitigation and flood management. Surface water hydraulics looks at the properties and flow of water, and how it behaves within different environments and structures (pipes, gutters, weirs, bridges, culverts, pits, etc.). Its applications range from urban flood management, to dam design or restoration and protection of natural water systems (rivers, creeks, etc.). We are currently involved in several surface water hydraulics studies involving advanced modelling of flood behaviour in hydraulically complex systems. In Horsley Creek, for example, flow patterns change dramatically with discharge (flood volume) and in rarer events flow is over land with little directional relationship to flow in the main channel. In addition, development has in some location led to the filling of small creeks and gullies to the extent that no ‘channel’ is left in these areas. 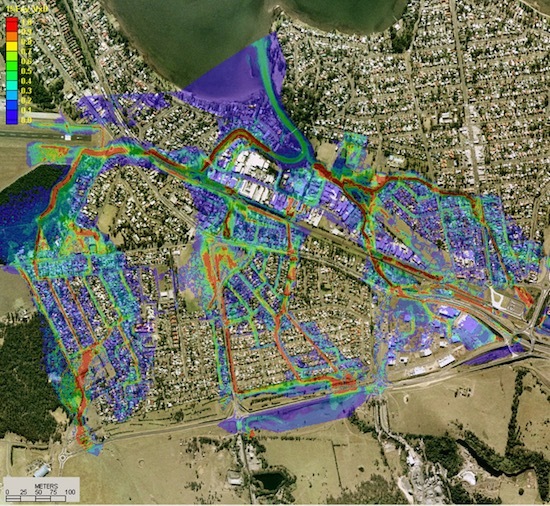 We used Tuflow (software) to simulate flooding in this system for a range of blockage scenarios and event patterns. The model also took into account the outfall conditions as flooding in the lower reaches of the system is controlled by the varying level of the lake into which the creek flows. A further study has been completed in the Macquarie Rivulet, north of the Horsley Creek catchment. 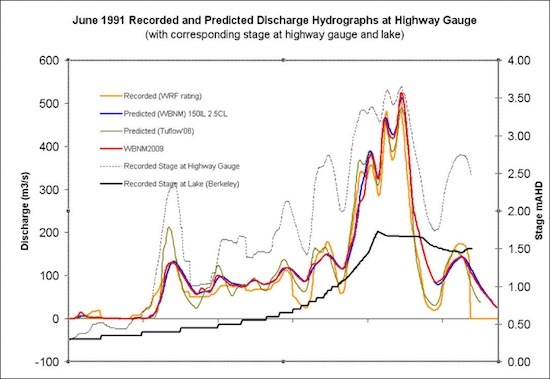 This was an important study for the region as it presented, for the first time, and opportunity to separately calibrate the hydrologic (WBNM) and hydraulic (Tuflow) models using the two stage/flow gauges and several recorded flood levels for the June 1991 flood event. Recently we completed a flood study of the Horsley Creek Catchment in Shellharbour for the Shellharbour City Council and the Department of Environment and Climate Change. 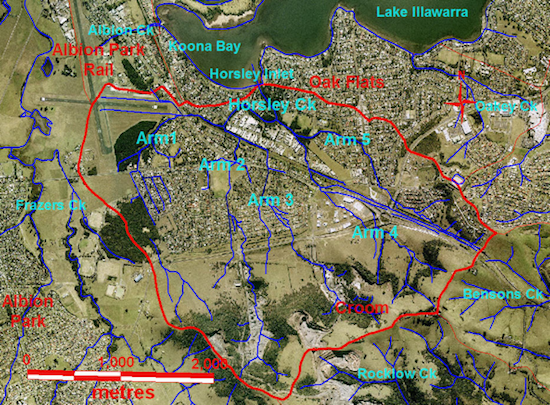 This 9km2 partly urbanised catchment has its headwaters in the Illawarra Escarpment and discharges into Lake Illawarra. It is a hydrologically and hydraulically complex catchment, with poorly designed watercourses, substantially (mostly unintentional) storages and ill-defined flow paths, often through built up areas at depth. Flooding in the lower reaches on Horsley Creek is very much controlled by the level of the lake into which the creek discharges. 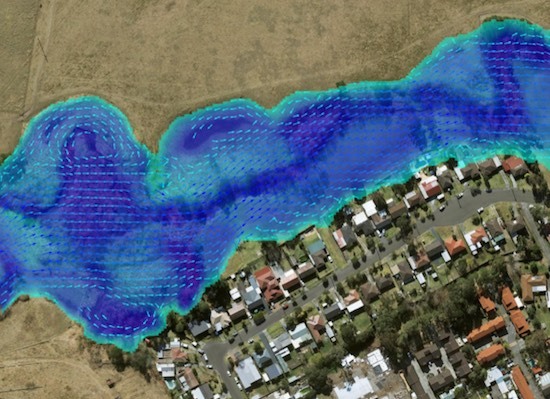 With the hydrologic and hydrodynamic modelling we provided, the council was better able to understand the volume and flow of water they were dealing with, and design and manage better infrastructure to mitigate future flooding.